Stephen Talasnik's newest permanent, site-specific sculpture is "Pioneer", a cedar structure rising 35 feet in the air, with a footprint of 45 x 35 feet at the base. The "exterior infrastructure" supports 3 habitable rooms or "seeds". It was engineered by Arup engineers and built by Gunnstock Timber Frame of Powell, Wyoming. 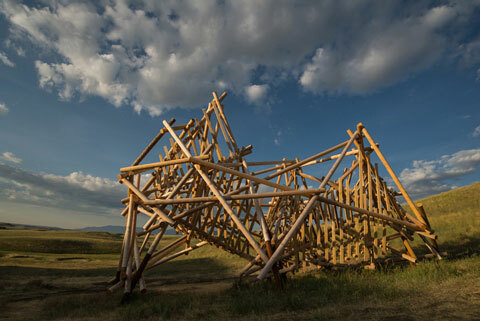 It is located at the new Tippet Rise Art Center, in Fishtail, Montana. Stephen Talasnik, "Pioneer", 2016, yellow cedar with corten steel footing.